During the research accompanying the 50 filling stations program, the Fraunhofer Institute for Systems and Innovation Research ISI, based in Karlsruhe, Germany, used refueling tests and focus groups to determine to what degree hydrogen filling stations have become accepted by experienced users and trial customers. The results show that a hydrogen refill is typically regarded as a safe and simple procedure, although it still represents a challenge – especially for trial customers. With the 50 H2 stations program, the German Federal Ministry of Transport and Digital Infrastructure (BMVI) supports the expansion of the H2 filling station network in Germany. The project is part of the National Innovation Program Hydrogen and Fuel Cell Technology (NIP) and is coordinated by the National Organization Hydrogen and Fuel Cell Technology (NOW). It enables the thorough testing of increasingly market-ready hydrogen filling stations under close to real-life conditions as an important step toward market preparation. Besides user opinions, the research accompanying the program analyzes the ecological, economic, regulatory and technological aspects of the construction and operation of hydrogen refueling stations. So far, hydrogen refueling has been available in Germany at around 34 stations, of which 20 are accessible by the public . In large cities, such as Berlin and Hamburg, users can fall back on three to four filling stations, whereas other German regions have been less fortunate. For comparison: Drivers of conventionally operated vehicles were able to refuel their car at over 14,000 gas stations in 2015  and drivers of natural gas vehicles could rely on a network of 850 publicly accessible locations . As a collaboration between industrial companies and with support from the public sector, the Clean Energy Partnership has been the lighthouse project of NIP’s transportation division since 2008. The partner companies of CEP have tested the system capabilities of hydrogen and developed technological and economic solutions for daily use scenarios. To examine user acceptance, ISI organized a series of refueling tests at an H2 filling station in Berlin, Germany. During the course of these tests, each user filled up the tank of a hydrogen vehicle. Prior to it, he or she had received a brochure explaining step by step how to refuel the car. No (further) details were given. During the test, the researchers stood by the entire time to answer questions or provide assistance. The tests were conducted with two groups of people: One with six who had experience in refueling H2 vehicles and another one with eight who had no such prior knowledge. All people taking part in the test possessed basic operating knowledge of cars. From the customers who had prior experiences with hydrogen refueling, four owned a hydrogen vehicle at the time of the test, whereas the other two had driven one in the past. The period of hydrogen car use ranged from half a year to two and a half years, whereas all vehicles had been used primarily in Berlin. Three people had the car solely for business purposes; the other ones had a mixed private-business use case. There was a monthly leasing rate paid for the car. The test was completed by altogether 14 people: Seven women and men each, aged 23 to 72. Nine of them had a college degree. These participants also received two short questionnaires, one before and one after refueling. The questionnaires made it possible to conduct a before-after comparison of expectations and experiences by the group of trial customers – since the ones with prior knowledge had already refueled hydrogen cars before. During refueling, everyone was asked to “think aloud,” to enable the researchers to record assessments and perceptions immediately. After the refueling tests, the participants were divided into focus groups to discuss the experiences made during refill as well as to provide an overall assessment of the H2 technology. Focus groups are group debates among three to eight people, moderated by a researcher and based on a discussion guide. The group dynamics make it possible to obtain more profound insights into the thought process than would have been possible during separate interviews. All participants successfully completed the hydrogen refill. Two trial customers, who purposely did not read the brochure before refueling, were nevertheless able to complete the task. Several participants, however, turned to one of the researchers during the procedure, as they weren’t so sure about some of the steps. It took each participant between five and thirteen minutes from getting authorized at the card reader to putting back the fuel nozzle. With the experienced customers, who had already filled up the tank at this test station, the procedure seemed very routine. They were faster than both the trial customers and the ones without any prior knowledge of refueling the car at this location. Some had problems taking out the nozzle and putting into the fuel fill inlet. Additionally, several participants had difficulties releasing the nozzle after fueling and putting it back, since it is relatively heavy and has to be held at a certain angle. There were also some technical problems with the price and volume indicators on the filling station display as well as with the button to start refueling. With three of the participants, the pump didn’t even start or the procedure was cancelled, making a second attempt necessary. This caused a bit of irritation among some customers, especially among the ones without prior knowledge. The majority, however, regarded H2 refueling as a simple and uncomplicated process. Most trial customers rated H2 refills similar in complexity to conventional ones – both before and after the test. More than half of them were convinced that one could get a good grasp of the system after several times refueling a car. Four of the experienced customers thought hydrogen refueling was more complicated (see figure 1). One possible explanation could be that these customers hadn’t been used to this particular filling station – each hydrogen station may require operation in a slightly different manner. The experienced users may have also had higher expectations of the practicality of the technology in daily use and thus expected a simpler procedure. During the focus group discussions, the trial customers said that hydrogen refueling was similar to filling up tanks with conventional fuel. They welcomed such parallel approaches. Two customers mentioned that they appreciated the absence of any smell during H2 refueling compared to typical gas or diesel refills and that the fuel could not dirty up your hands. Some saw the downside compared to conventional refueling in the cold fuel nozzle and the condensation water resulting from it. Some also criticized the design of the fuel nozzle, which in their view resembled typical gas or diesel interfaces: For example, the trigger lock was unnecessary for refueling, they said; alternatively, they suggested a type of turn lock (similar to LPG refueling), which could better tell the user that both components – vehicle and fuel nozzle – were inextricably linked to each other. Another interface currently used in Germany does meet user expectations in this regard. The majority rated the time it takes to refuel the car as appropriate. 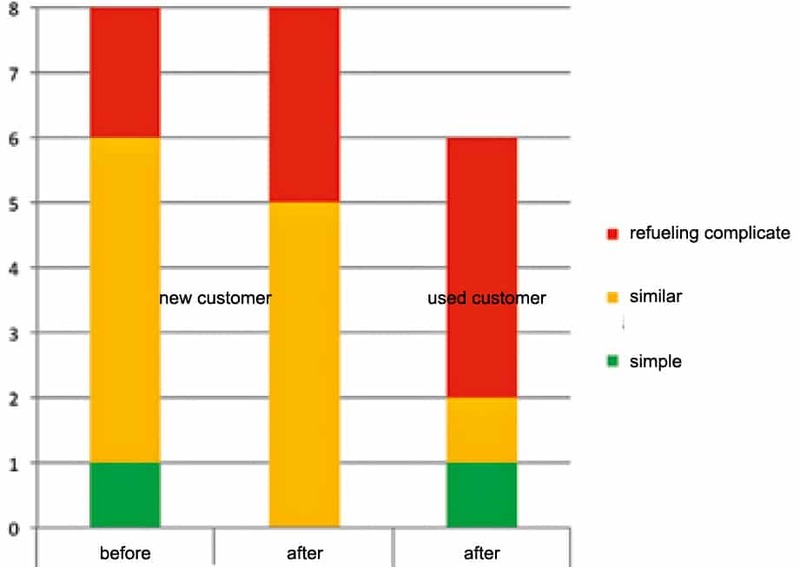 This question again revealed the differences between both groups of users: The experienced customers rated the refueling time a bit worse than the trial customers (after refill). This may also be explained by the former group’s daily use of fuel cell cars and their correspondingly high expectations of the technology. Additionally, their judgment may have also been influenced by bad experiences with past refills. Conversely, the trial customers expected a longer refueling period, but were pleasantly surprised by the rather short time it took them. The majority of the people who took part in the test had no safety concerns while refueling. However, they described their feelings with a certain “respect” for the new technology. The experienced customers said that possible concerns disappeared over time, also because the flammability of gas and diesel could equally pose a risk during refueling. Moreover, the participants showed great trust in German safety standards, so that the high pressures were not seen as a safety concern. The handed-out questionnaires confirmed that the majority did not worry about the safety of the procedure. However, one experienced customer – who encountered technical difficulties while refueling – expressed a negative opinion about the safety of the H2 refill (see figure 2). The participants appreciated in particular the local absence of emissions in fuel cell cars. They welcomed the guarantee of sustainability and rated it as an important prerequisite for the further promotion and expansion of the technology as well as for future use. Especially the experienced customers called for a further expansion of the network of filling stations: The main goal should be to close the gaps primarily found in middle Germany, so that drivers can travel across the entire country. Because of the slow expansion of the network, the technology was currently not an alternative in a daily use scenario. And high vehicle costs ran counter to the idea of private individuals purchasing such cars. All in all, it should be noted that H2 technology has been well received, albeit there are still some challenges to be overcome before everyday use is deemed practical. One of the aims in further promoting the technology should be to simplify the use of the fuel nozzle and improve the technical reliability of filling stations. Especially new customers, who have had no experiences with hydrogen refills, could be unsettled by running into technical difficulties. On the other side, most participants stated that hydrogen refueling was an intuitive learning experience. The new customers welcomed specifically the refill period, which they perceived as taking little time. The experienced customers had higher expectations of the technology’s practicality and showed little patience for downtimes and difficulties. They also expected a further reduction in the number of minutes it takes to refuel. In the end, what remained was the call for an expansion of the H2 infrastructure and a wide-spanning network of filling stations to allow for a new kind of driving experience across all of Germany.